Looking For a Fiber Optic Installer? Use the FOA Installer Database Free! 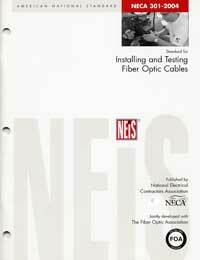 The FOA's textbook, The Fiber Optic Technicians Manual, is used by our approved schools around the world to teach fiber optics. While most technicians working with fiber optics use English as a technical language, we have heard from many instructors that the book would be more useful if it were available translated into local languages, especially Spanish, due to the growing market in Latin and South America. The FOA, working with Delmar Publishing and Francisco Castro Cabrera of Mexico City, who is starting up our new FOA chapter in Mexico which will service Spanish-speaking countries, has produced the first textbook for fiber optics in Spanish. 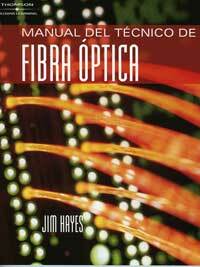 Translations were done by Francisco Castro with review by Patrick Sullivan who teaches fiber optics in Spain. Now we have our textbook in Spanish, we have also translated our CFOT exams and will have other FOA materials available in Spanish soon, greatly facilitating the training of fiber optic technicians in Spanish-speaking countries. As a participant in a panel discussion on providing broadband connections to rural customers recently, audience members wanted to know if they should go ahead with fiber optics or continue to use copper. It was mentioned by a participant from the government that the agency that funds rural expansion will only fund communications future projects that plan to offer more than 45 Mb/s capacity to allow for HDTV transmission and that really means that only fiber is acceptable. I told the audience that here in California, the AAA advertises "Sooner or later, you'll break down and join AAA!" 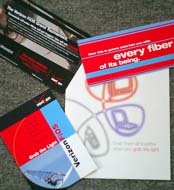 I thought the fiber optic business should adopt a similar motto: "Sooner or later, you'll break down and install fiber!" While on a recent visit to Boston, we ran across a Verizon FiOS kiosk at the Burlington Mall shopping center. It had several computers connected on FIOS and knowledgeable personnel manning the kiosk. Literature (right) explained FiOS technology and services well. According to the signs in the kiosk, FiOS service is available in over 35 towns in the Boston suburbs, New Hampshire and Rhode Island. What's a FiOS install like? See Dan Bricklin's description at http://www.bricklin.com/fiosinstall.htm. Trivia: Who is Dan Bricklin? He's the guy who co-developed "Visicalc," the first PC spreadsheet and the "killer ap" that led to the widespread adoption of PCs by business! More Trivia: What does "FIOS" mean? FIber Optic Service? According to Wikipedia, Verizon's Trademark (No. 3001081) application says FiOS is a Gaelic word for "knowledge". Holey fibers are a subject of much R&D, but primarily for trying to create fibers that are higher bandwidth or have particular characteristics to modify transmission parameters. A UK defense contractor has another idea. A holey fiber has been fabridated with 37 holes sized exactly to be singlemode at 850 nm. A number of VCSEL sources were aligned with individual holes to transmit separate signals, in effect creating a parallel transmission link over a single fiber. Their goal was to create a faster link between IC chips at lower power that copper interconnects, but one suspects it could be a contender for 10 or 100 Gb networks. Read more at http://fibers.org/articles/news/8/7/2/1. How do you design and manufacture fiber optic systems? Choose and install one to serve your communications needs? Troubleshoot problems? The FOA Fiber Optic technical Bulletins will provide step-by-step guidelines to help you. All are PDF files you can print and use. The 2006 FTTH Conference & Expo will be held in Las Vegas at The Venetian Resort · Hotel · Casino on October 2 ­ 5, 2006. As usual, the FTTH Council will have many informative technical sessions and a lively trade show. The 2006 FTTH Conference & Expo will attract over 2,500 FTTH leaders and decision makers from across North America, Europe and Asia to hear keynotes from industry visionaries, learn from over 50 track sessions and meet with 170 exhibitors representing the latest services and technologies. Hiromichi Shinohara, Director of NTT Access Network Service Systems Labs, will open the conference on October 3rd. Mr. Shinohara has been engaged in research and development of fiber optic cables, broadband networks and optical access systems since joining NTT Laboratories in 1978. The conference lineup of keynotes also include Robert (Bob) Ingalls, President of Verizon,s Retail Markets Group, Jeffrey Weber, Vice President, Product & Strategy, AT&T and featured speaker Jim Carroll, futurist, trends and innovation expert. Don't miss the premier FTTH event of the year. See http://www.ftthconference.com/ for more details and online registration. While in New York City recently, the papers carried an interesting story. Three homeless men were arrested for starting one of the largest fires ever in NYC. They were stealing copper wire from abandoned buildings and were told it was higher priced without insulation. So they piled the wire outside one of the buildings, doused it with gasoline and torched it off. As the fire got out of control, it burned a bunch of abandoned buildings. Three men were arrested in Lake Tahoe for cutting down phone lines to steal the copper and disrupted communications in the area. And one person was killed trying to cut down a live high voltage power line to steal the copper. What connector is this? We're going to run a few months of having you try to identify fiber optic connectors, some common, some obscure. Recognize this one? 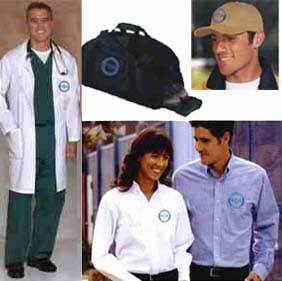 It's still used in some process control and military applications. Why are there two versions? FOA Tech Bulletins - for those designing FO communications products or installing cable plants. Download all three. Does Glass "Flow"? Is it really a liquid? What Happens When You Mate Mismatched MM Fibers? New PowerPoint Presentation Introduces Fiber Optics - in English or Spanish! The FOA CFOT and CFOS programs continue to gain momentum in fiber optics. Over 15,000 CFOTs have been certified by over 120 schools as the FOA completed its 10th year. Since our founding in July, 1995, we have dedicated ourselves to promoting fiber optics and professionalism in fiber optics personnel, focusing on education and certification. We are continuing to add new schools and more CFOTs as users of fiber optics learn that a CFOT is the indication of a professional, well-trained fiber optic technician. Now with FTTH (fiber to the home) finally taking off, demand for CFOTs is rising and schools are responding by expanding programs rapidly. The FOA now has approved programs at 125+ organizations, welcoming new additions like the Joint Apprenticeship and Training Committee of the International Brotherhood of Electrical Workers, Corning Cable Systems for their installation training programs and NASA's Goldstone Tracking Station. The complete list of FOA-Approved schools is at http://www.thefoa.org/foa_aprv.htm. Remember to renew your FOA certification. All current CFOTs have a ID Card with their certification data and we keep a database of current CFOTs to answer inquiries regarding your qualifications if needed. If you forgot to renew, use the online application form or the FOA online store to renew NOW! 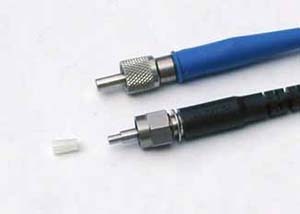 (C)1999-2006, The Fiber Optic Association, Inc.
Amphenol developed the SMA from the "Subminiature A" hence SMA, microwave connector. The model 905 had a machined ferrule exactly 1/8 inch in diameter that mated in a machined adapter. When the adapters were not precise enough for better fibers, a necked-down ferrule that mated with a Delrin adapter for better insertion loss performance. These connectors are still in use on some military and industrial systems. Want help identifying fiber connectors. See the FOA Tech Topics Connector ID page.